The UK is the most lucrative formats market in Europe, while TF1 is the leading broadcaster and Money Drop and Come Dine with Me are the most successful formats in the region, according to new research. Endemol, ITV and FremantleMedia, meanwhile, are Europe’s most successful formats distributors. Knowing the value of your content is a vital tool in the international market. That’s why media specialists Madigan Cluff, Essential Television Statistics and Digital TV Research have measured the number of hours of formatted programming scheduled across European free-to-air channels and the income generated by each format. Specifically, their latest report, TV Formats in Europe, reveals the financial success of unscripted entertainment shows that have been made in multiple territories. The results make for interesting reading. Going by distributor, Endemol, FremantleMedia and ITV are the three frontrunners in terms of both hours of formats on air and the value these formats generate for their broadcasters. However, the top three change dependant on which of those metrics is used. In terms of number of hours, ITV Studios Global Entertainment is top of the heap with 4,352, comfortably ahead of Endemol Worldwide Distribution with 3,460 and FremantleMedia International with 3,136. Red Arrow and Shine International place fourth and fifth ahead of Zodiak Rights, All3Media International, Eyeworks and Talpa. 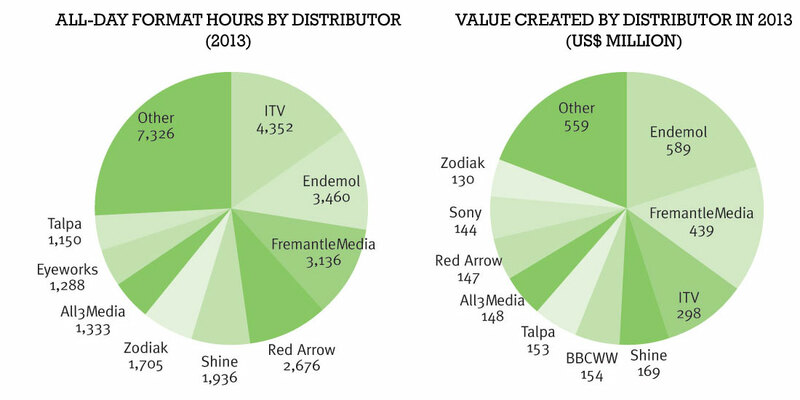 The top four distributors account for just under half of the format hours screened in 2013. ITVS, which is also the largest distributor by hours in 2012, held the top spot mainly because of the ongoing success of Come Dine With Me. FremantleMedia supplies ten titles in the top 100, while Endemol and Red Arrow supply nine apiece. In terms of the value created by the distributors’ formats, Endemol tops the list with its formats generating US$589 million, 20% of the total. FremantleMedia is second, generating US$439 million, 15% of the total. ITVS generates 10% of the total, almost US$300 million. The research houses have found that the cumulative value attributed to the broadcast of entertainment formats across Europe slipped last year, although it has largely withstood the economic impact of the recession. The top 100 formats generated US$2.9 billion compared with US$3 billion in 2012, but the figure is ahead of the 2011 total. The UK, France and Germany account for 72% of the total, with the UK generating the most from formats by bringing in US$600 million of the total in 2013. However, this is a decrease on the 2012 total of US$677 million. The value of formats to French broadcasters is growing and was US$599 million last year compared with US$547 million in 2012. In terms of revenue generated by formats, French commercial broadcaster TF1 leads the way, generating US$331.5 million. Meanwhile, the number of hours of formatted programming aired across the 84 channels surveyed is flat year-on-year at 28,386. Madigan Cluff director Michael Cluff says that the Europe-wide market for formats is showing resilience given that there has been an advertising recession and several top-performing titles have peaked. In terms of specific titles, Come Dine With Me is the top European format, notching up 3,778 broadcast hours across the continent, fractionally more than it attained in 2012. Red Arrow’s celebrity cooking show Fish on the Cake is second with a cumulative 1,200 hours, a total significantly down on the 1,765 the previous year. Shine International’s MasterChef is third, recording a massive increase from the 600 broadcast hours it attained in 2012 with 1,199 hours. Eyeworks’ Who Wants to Marry My Son and Endemol’s Big Brother round out the top five, with largely similar broadcast hours as in the previous year. Jonathan Bailey, managing director at Essential Television Statistics and co-author of the report, notes that culinary formats remain in vogue. “The most significant trend is the continued growth of food formats, often scheduled in access prime time,” he says. 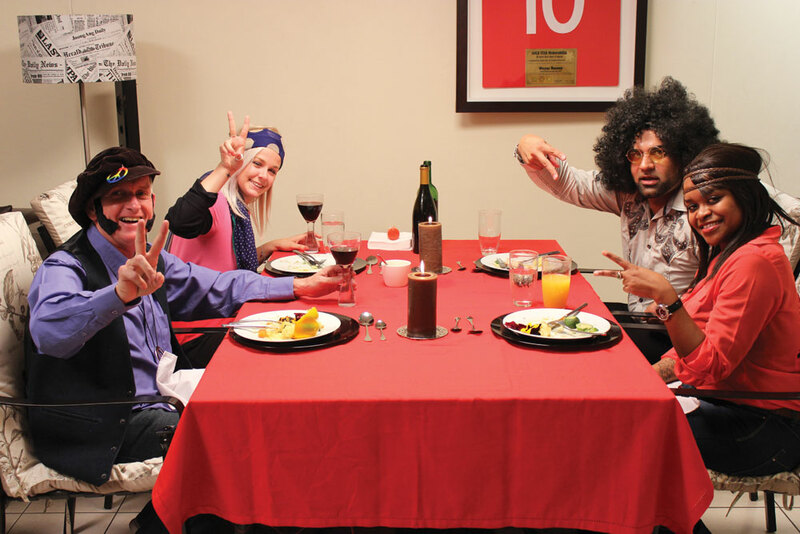 By value, Come Dine With Me also wins out, although despite increased broadcast hours and the US$205.6 million generated, it earned slightly less than in 2012 when it made US$209.5 million. Another Endemol format, Money Drop, also made less money (though the format has grown quickly since its international launch in 2010). In 2013 it generated US$197.5 million compared with US$224.7 million a year earlier. The trend continues, with Deal or No Deal generating US$140.5 million against US$141.7 million in the previous year. The one show in the top five that made more money in 2013 than 2012 is Talpa singing competition series The Voice, which pulled in US$140.1 million last year and US$128.1 million a year earlier. Below the top five, All3Media’s Be My Guest added the most value in 2013, increasing from US$11.1 million in 2012 to US$60.2 million in 2013. Not quite as dramatic but still impressive, Global Agency’s Shopping Monsters climbed from US$17.4 million in 2012 to US$49.1 million in 2013. At the other end of the scale, the value generated by Galileo fell from US$150 million in 2012 to US$96.2 million in 2013. Similarly, CBS Studios International-shopped Survivor dropped from US$63.8 million in 2012 to US$11.0 million in 2013. *The value attributed to programming is the financial benefit sourced by activities such as advertising revenues or a proportion of annual household license fee income that broadcasters receive from screening these formats. Channels are getting hungrier and hungrier for food formats. 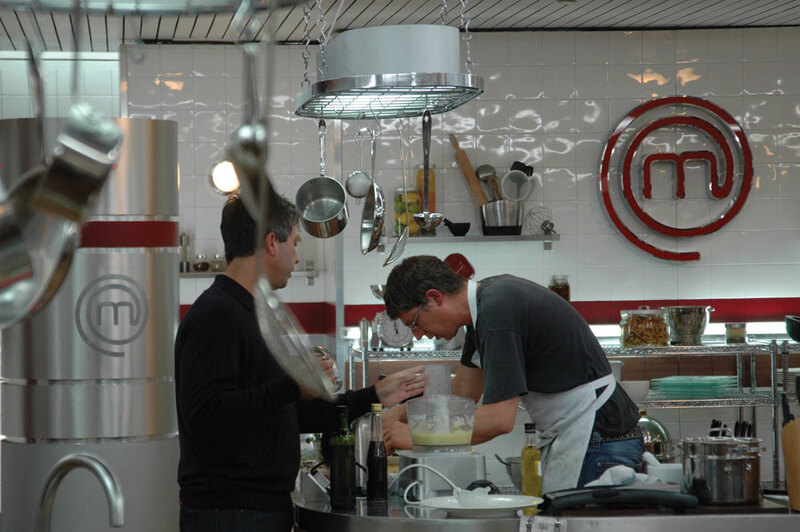 As the authors of TV Formats in Europe note, appetite is increasing as audiences crave everything from major vehicles like MasterChef (above) to local celebrity chef-fronted originals. For example, Europe’s most valuable format, Come Dine With Me, has been remade 36 times, most recently in India for Star TV and Brazil for Globo, marking its first appearances in Asia and Latin America. Meanwhile, Red Arrow’s inventively titled Fish on a Cake remains a staple of broadcasters, especially in Scandinavia, and MasterChef, which doubled the number of its broadcast hours last year, has had 45 signed production agreements. Besides these old favourites, new food-themed formats are hitting the market and coming from all corners of the globe. One interesting deal has seen All3Media International acquire rights to Ultimate Braai Master, which has run to two seasons on public broadcaster the SABC and beat other cooking formats including the South African version of MasterChef. A third season is in the works, but for SABC’s commercial rival ETV. The Cooked in Africa Films-created format, based on the South African braai barbecuing culture and launching at MIPTV, sees 15 pairs of cooks embark on a 60-day road trip and take part in challenges including catching and cooking their own food and recreating classic dishes on an open fire. Also in South Africa, Food Network recently ordered the first non-North American version of Chopped, which sees four local chefs per episode tasked with turning everyday ingredients into an amazing three-course meal, with the eventual winner netting a cash prize. Elsewhere, South Korea’s CJ E&M, which is emerging as one of the Asian territory’s premiere formats distribution companies, sold its 13x60mins Crazy Market food-quiz format in Ballandi Multimedia in Italy, while Ukrainian commercial channel 1+1, Abu Dhabi TV, Serbia’s Nova, Macedonia’s Alfa TV Dooel and Kazakhstan’s Channel 7 have all gone for local versions of the Global Agency-distributed Rivals in Law, in which mothers and daughters-in-law are pitched against each other in a culinary competition. 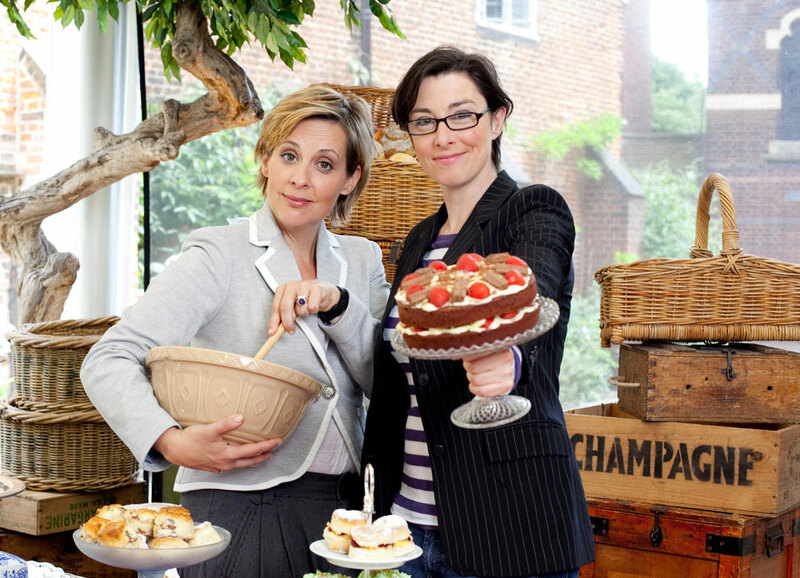 In the UK, producer Twofour is working on another foodie series for Channel 4, titled Cooks’ Question Time (WT), fronted by Sue Perkins, who is also the face of BBC Worldwide-sold cooking-themed format hit Great British Bake Off.